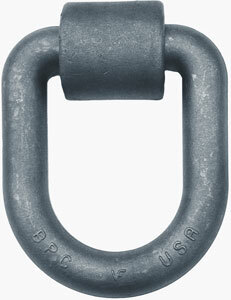 D-RINGS & ROPE RING - Auto Wheel Services, Inc.
B38 1/2" Forged D-Ring w/ 2-Hole Mounting Bracket, 3-1/2" x 3-3/8" O.D. 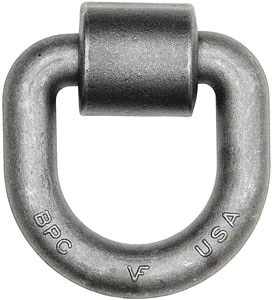 D-RINGS ARE NOT APPROVED FOR OVERHEAD USE! • Requires 3" dia. mounting hole in 3/8" or thicker material. Working load limit: 265 lbs. form a surface mount rope ring. Ultimate breaking strength: 1,500 lbs. Formed 1/8" steel pan houses a ductile iron ring. 3-5/8" dia. hole with 7/8" clearance below surface is required. 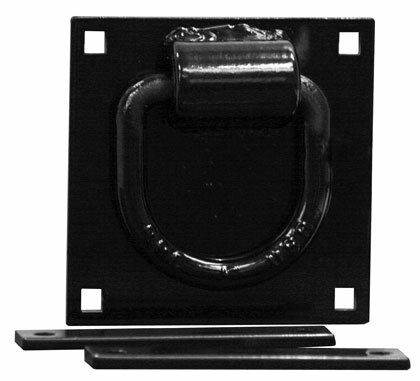 Square mounting holes for use with 3/8-16 x 2-1/4" carriage bolts. ​Ultimate breaking strength: 6,000 lbs.